Civil society organisations of indigenous Finno-Ugric peoples from Russia, Estonia and Finland are among the first to join preparations for the International Year of Indigenous Languages 2019 that has been proclaimed by the United Nations General Assembly. Representatives of Finno-Ugric peoples from the Baltic Sea Region have established a civil society network for preserving and revitalizing indigenous Finno-Ugric languages, by proposing concrete steps for ensuring sustainability of these languages. Activities of the project include a mini-grant programme for supporting local language initiatives and design of an interactive publication about good practices of language preservation and revitalization led by the civil society. The project, funded by the Nordic Council of Ministers, will strengthen language activism in the Baltic Sea Region and will present the unique Finno-Ugric experience to international venues. To launch the project “Civil Society Network For Revitalising Indigenous Languages”, partner organisations from Estonia, Finland and North-West Russia, under the leadership of the Association of Ethno-Cultural Centres “ECHO”, met in the historical Karelian village Kinerma and in the Karelian Language House in Vedlozero (Vieljärvi) on September 3-5, 2018. A number of external experts and representatives of Karelian authorities were invited to the discussion. Zinaida Strogalschikova, a well-known researcher at the Karelian Academic Centre and a leader of the indigenous Veps community, gave an update of Russia’s legislation in the field of language policy and analysed opportunities for civil society participation in the preservation and revitalization of indigenous peoples’ language. Natalia Antonova, expert of pre-school immersive learning, demonstrated by the example of the Karelian Language House how to mobilize the local language community around a civil society initiative. Other speakers included Elena Migunova (Head of the Department of State Support to Indigenous Peoples in the Republic of Karelia), Gennady Sarayev (Ombudsman of Children’s rights in the Republic of Karelia) and Tatiana Kleerova (Head of the Board of the 8th Congress of the Karelian People). All speakers welcomed the new project – from now on to be branded as SANA 2019 – and shared their views on how to best organize project work with local communities. As a host of the working meeting, Karelian Language House presented the results of the arduous work of language activists at Vedlozero. 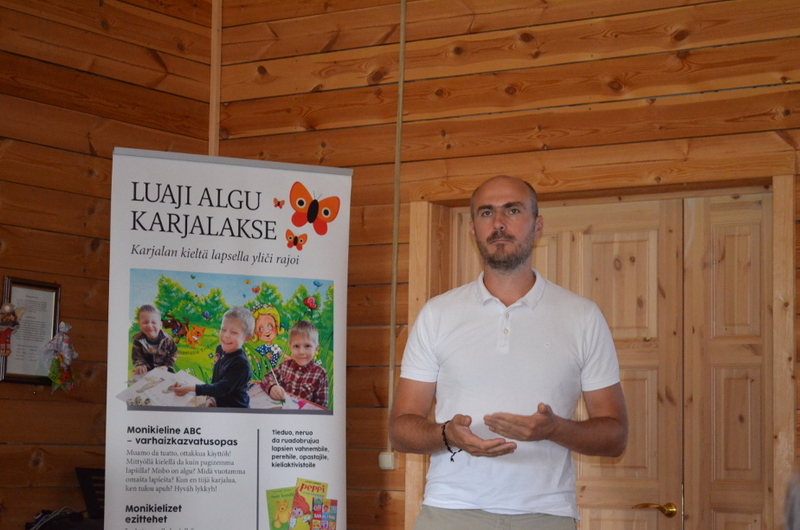 Children attending the Karelian language nest (kindergarten) participated in a workshop held in Karelian language on preparing a traditional Karelian dessert töncöi. Cultural programme also included a performance by Santtu Karhu, veteran of Karelian folk-rock. Partners of the new project took an opportunity to interact with the local community, announcing a mini-grant programme for supporting local initiatives for developing Finno-Ugric languages. Thanks to this programme, NGOs, informal associations and even individual activists will be able to fund their new and bold language initiatives that explore linkages with handicrafts, livelihoods, traditional knowledge, information technologies and cultural heritage. The next partners’ meeting will be held at the end of October during the Finno-Ugrian Days in the Seto village of Obinitsa (Estonia) – Finno-Ugric Capital of Culture 2015. The project “Civil Society Network for Revitalizing Indigenous Languages” unites organisations for preserving and revitalizing indigenous languages in the Baltic Sea Region and supports the goals of the International Year of Indigenous Languages. The project will partly overlap with the UN-proclaimed International Year of Indigenous Languages 2019, to the implementation of which project partners will provide substantive contributions as well as learn from worldwide good practices. The project brings together the following 7 partner organisations: Association “ECHO” (Karelia) as the lead partner, Centre of Support and Public Diplomacy of Indigenous Peoples “Young Karelia” , the Karelian Language House (Republic of Karelia), the Community of the Small-Numbered Izhorian People (Shoikula), Centre for Development of Indigenous Peoples “URALIC” and Seto Cultural Fund (Estonia) and the Saami civil society organisation “Giellabalggis” (Finland). The project is funded by the Baltic Sea NGO programme of the Nordic Council of Ministers.